First aid and defibrillators are available on each campus. In addition Medical Centres are located on the Main Campus & on the College St Campus. Always ensure you know where medical centres are located, who the first aiders are in your area are and where the nearest first aid facilities are located. Automatic External Defibrillators (AEDs) - are used to administer an electric shock to a person who is having a cardiac arrest. AEDs are designed to allow non-medical personnel to save lives. 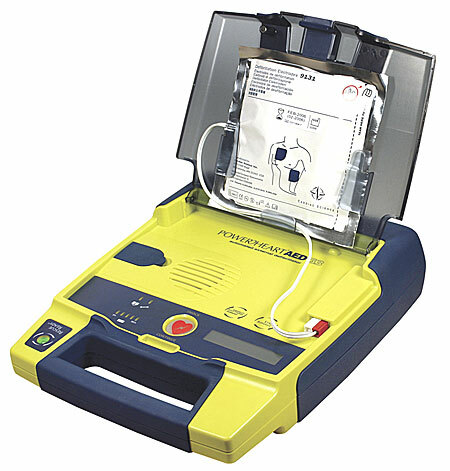 Two pads connected to the defibrillator are placed on the patient’s chest. A computer inside the AED analyses the patient’s heart rhythm and determines if a shock is required to save the victim. If a shock is required, the AED uses voice instructions to guide the user through saving the person’s life. AEDs require specialist training and participants must have basic life support training completed prior to commencing AED training. Trained AED personnel are available throughout each campus, their contact details are available at each of the AED locations and on the health & safety noticeboards.